Hope you're all well and enjoying a little sunshine. I hooked up this lovely fresh daisy the other day, I think I feel some spring time bunting coming on! I've added the the ball of wool I found in my stash, again I've left it unfinished in case I have the erge to add to it again. I've been making granny squares and trying to be good adding them on as I go I have nearly got the right width now. Betty appears to have claimed it already! She enjoyed finding a sunny patch and snuggling down. She is so tame now, loving and loyal you'd never have know she was feral. I hope you will all have a lovely weekend and fingers crossed for some decent gardening weather, my garden certainly needs some attention now. Really looking forward to sowing some seeds too! I love your little daisy. That would be so cute as a garland. I am making that same blanket. I am up to 174 squares. I think I am getting close to done. Hope you have a wonderful weekend also. Your flower quilt looks great! That little daisy is very cute! Oh yes, this weather is lovely! I like your granny squares, I think the black edging looks really good. 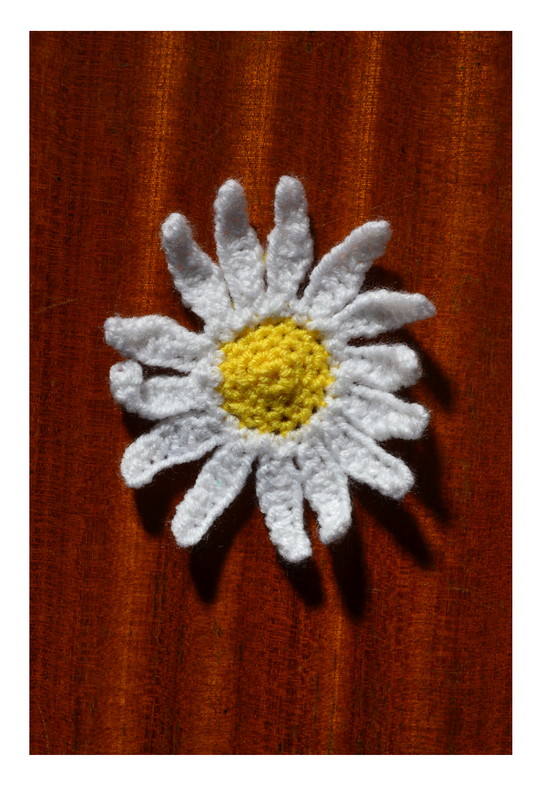 I love your daisy too FB - bring on the spring bunting! And the never ending blanket is never ending again - keep going girl, it's so lovely! Also your squares are gorgeous in their lovely bright shades. 'Betty' is looking beautifully settled, and by the look of her little paws I would almost suggest that she is happily purring her little head off there! Such a pretty little daisy! I hope you have had some sunshine today and enjoyed some gardening, I love this time of year when everything is growing. The daisy is so sweet. Betty is adorable with her new favorite blanket. :) Have a wonderful week. I hope you have perfect spring weather to get outside.